Information technology is merging with traditional technologies used in manufacturing and supply chain operations. Traditional technologies such as machines that make products in factories, forklift trucks that move products within warehouses, and vehicles that deliver products to customers are all taking on new capabilities as they merge with information technology. Activities involved in moving physical products from one location to another remain the same, but the ways in which these activities can be planned and carried out are changing in a big way. To create a big-picture context for thinking about this let’s imagine a company called Fantastic Corporation. They make a fantastic home entertainment system, and sales are growing nicely. They import component parts from suppliers in Asia, and do assembly and distribution in the United States and Canada. Their global supply chain is shown in the screenshot below. As they grow their business they are looking for ways to improve productivity in their supply chain and handle increasing volumes of products. The company’s supply chain in North America is shown below. In Tacoma (1) there is some light assembly work; and in Los Angeles (2) further manufacturing and final assembly is done to create finished products. Products are then delivered to stores on the west coast from their distribution center which is attached to the factory in Los Angeles. They also ship finished products to another distribution center in Chicago (3) where products are delivered to stores in the central and eastern parts of North America. Supply chains are about managing the flow of products to meet demand and respond to changing market conditions. Fantastic Corporation is looking for ways to use new technologies in their supply chain to increase product flow, and improve timeliness and accuracy of product deliveries to customers. They are investigating opportunities to apply a mix of new technologies to achieve these results. Robots in industry have been around for more than 40 years. But now they are reaching a level of sophistication and affordability that is causing their use to spread quickly. Robots can be connected together in cells to complete complex manufacturing tasks, and they can be used in warehouses to travel back and forth to storage racks to put away products and pick products for shipping. DEFINITION “Essentially, a drone is a flying robot. 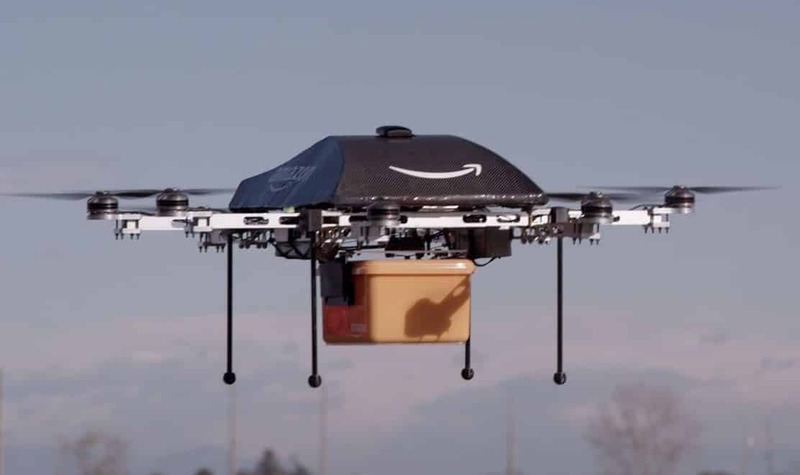 The drone may be remotely controlled or can fly autonomously through software-controlled flight plans in their embedded systems working in conjunction with onboard sensors and GPS.” (TechTarget, IoT Agenda, Drone, http://internetofthingsagenda.techtarget.com/definition/drone). The flying robots get lots of attention, but a drone is a drone whether it flies, walks, drives, floats, swims etc. A drone is essentially any driverless vehicle that is remotely controlled or can operate autonomously. Different kinds of drones can be assigned to move products in different parts of a supply chain. For instance, factories can send large driverless trucks loaded with products to warehouses, and warehouses can send aerial drones or small driverless vans to deliver products to individual customer offices or houses. DEFINITION “3D printing, also known as additive manufacturing (AM), refers to processes used to create a three-dimensional object in which layers of material are formed under computer control to create an object.”, (3D printing – Wikipedia, https://en.wikipedia.org/wiki/3D_printing). It is possible to manufacture some products on demand by creating them from simple feedstock such as plastic pellets or powdered metal. Inventory managers do not have to try to predict demand and carry stock for lots of different products if all of them can be created on demand by machines using a common feedstock. Additive manufacturing technology is able to make products ranging from parts for cars and airplanes to furniture and household utensils. Supply chains that can employ additive manufacturing have the opportunity to generate significant improvements in inventory management and reduce their costs of moving and carrying inventory. They can also increase their customer service levels because they are less likely to run out of the products that customers want when they can manufacture those products on demand from a common feedstock that is more easily kept in stock. AI is also referred to as machine learning. As computers and computer software become more powerful they can do things such as find patterns in masses of data, understand human speech and even compete with humans and win in games such as chess or poker. As computer technology merges with mechanical technology the result is driverless vehicles that can steer themselves from one destination to another, robots that can do complex tasks once only possible for humans to do, and machines that learn from experience and keep improving their own performance. DEFINITION “The interconnection via the Internet of computing devices embedded in everyday objects, enabling them to send and receive data.” (Google online dictionary definition from Google search on “Internet of Things”). The IoT is all about the sending and receiving of data to support the relentlessly growing need for accurate, real-time information to improve supply chain operations. Supply chains are under a lot of pressure to get better, faster, and more efficient, and all of that requires more data. Fantastic Assembly Plant, Tacoma WA – At the port of Tacoma, Washington (screenshot below) they are using driverless delivery trucks to bring container loads of component parts from cargo storage yards at the port to the Fantastic Company assembly plant (yellow arrows and circle in screenshot below). The assembly plant uses industrial robots to assemble the component parts into larger sub-assemblies that are then shipped on to Los Angeles for final assembly into finished products. The robots speed up the assembly process and enable increased product flow while just-in-time delivery of component parts by driverless trucks makes it possible to keep less on-hand inventory in the assembly plant. Fantastic Warehouse and Factory (2A and 2B), Los Angeles CA – Driverless trucks based at the Long Beach warehouse (circled in picture lower left) move cargo unloaded from arriving ships to the factory. Industrial robots are used for the loading of those driverless delivery vehicles that bring products to the new Los Angeles Plant. Fantastic Corp built their new plant in a large southern California transportation hub (2A). Robotic manufacturing systems in the plant increase production and these productions are fed by a just-in-time flow of products delivered by driverless trucks that bring component parts from the port of Long Beach (2B). And they are using 3D printing machines to make several components on demand at the factory as they are needed. These components are all made from a common powdered metal feedstock that is easy to manage and keep on-hand at the factory. And they are starting to use driverless trucks to bring finished products directly to two nearby stores. There are also automated conveyor belts and loading systems that fill freight containers with products and load those containers onto freight trains at the transportation hub for delivery to the Chicago DC. The Chicago DC (circled in yellow at bottom of screenshot below) receives shipments from Los Angeles by rail and uses robots and automated conveyors to handle higher volumes of products flowing through the DC. This enables them to avoid the cost of renting a larger facility so they can continue using their existing facility in Chicago as sales increase. They want to remain in their existing facility because it is close to an airport (circled in yellow at top of screen) where they can start using air freight to deliver their products to new markets opening up in Europe and South America. Fantastic uses IoT capabilities to track products and detect supply chain delays and problems in product operation at customer locations. Big data collected from IoT goes into predictive analytics software driven by AI for creating product demand forecasts. Based on these demand forecasts, AI software drives the changing factory production schedules so Fantastic Corp can respond to changes in product demand and adjust warehouse and factory operations as needed. Fantastic can quickly adjust its manufacturing schedules because of heavy use of industrial robots in their factories. AI created production schedules transmit the appropriate orders to industrial robots and production volumes and product mixes are quickly changed. In this way the company increases productivity and serves more customers without expanding the size of their facilities because they make better use of existing facilities. With drones and driverless vehicles Fantastic can quickly adjust its transportation activities to move inventory as needed to respond to changing demand. Transportation costs can be carefully managed, and AI is used to continuously update delivery schedules to ensure that customers receive their orders as quickly as possible. Once customers install their Fantastic Home Entertainment Systems, they connect to the Internet and send real-time data on customer usage and the operation of critical component parts. This information is used to improve product design and alert customer service when a part needs servicing. Marketing staff also use this data to find out about customer habits and preferences to use in improving product design and increasing customer loyalty. This is how successful companies use new technologies to create supply chains that become powerful competitive advantages.